Biographic Snapshot: Jim Levinson served as Director of the International Nutrition Planning Program at MIT, the International Food and Nutrition Center at Tufts, and the Office of Nutrition for United States Agency for International Development (USAID) in Washington, DC. He has worked extensively with governments in Asia and Africa and with U.N. agencies. He also led Jewish synagogues in New England for over 20 years and lived, with his family, in interfaith Catholic Worker communities for a dozen years. Hunger Notes: How did you get your start in this field? When I travelled to Vinoba’s village, intent on joining his walks for a year, I discovered that he’d been stricken with typhoid, and that his walking tours had come to an end. At that point, by then determined to stay in India (rather than returning to the U.S. and going to law school), I grabbed the “second best” opportunity, and took a job with United States Agency for International Development (USAID) in New Delhi. Hunger Notes: What is your best piece of advice for someone looking to get into development? 2. Get to work on a second language. 3. Get yourself some expertise in something with specificity – e.g. “public health” is too broad. Hunger Notes: You have had a long and amazing carrier, what have you been working on recently? Jim: After 50 years I was encouraged to put together a book, “Tales from the Field.” Beyond the stories, I’ve included my experiences with USAID, both the best and the worst, and adventures with concepts ranging from positive deviance and adolescent girls to the private sector, to the “happiness index,” to reasons why we do this work. For any of you specifically interested in nutrition, I have a section exploring its contemporary evolution, national commitment to nutrition, and experience with multisectoral nutrition convergence. Hunger Notes: Interesting! What is the “happiness index”? Jim: This is an interesting concept. Back in 1979, the then king of Bhutan, Jigme Singye Wangchuck, said “We do not believe in Gross National Product, (or the measure of a nation’s total economic activity). Gross National Happiness is more important.” In an early version of the index comparing countries according to happiness criteria, the U.S. came out 43rd. Costa Rica was near the top. Hunger Notes: Can you tell us one of your favorite stories of what it is like to work in this field from your recent book? Jim: Some of my very richest experiences in this work have been the spontaneous ones that were not part of any job description or scope of work – those spur-of-the-moment impulses that often lead to extraordinary happenings. I did some nutrition work in Ethiopia a few years which included looking at the wellbeing of women, their health, their status in their families and communities, their work burden, and opportunities they might have to generate income. Identifying such opportunities can be challenging in countries where the status of women is low and where they are often expected to do the most arduous labor. The women kicked in immediately – all basically saying the same thing – that their workload was impossible – and that the worst part of the workload was having to lug water for several hours every day. As anyone who has done rural focus groups knows well, a focus group of women will always have men hanging around on the periphery, despite even the best efforts to keep these discussions private. Sure enough, a group of men was nearby trying to listen in. One older man stood up and said, “Yes, we understand, but we men also have lots of work to do, and men carrying water is against our cultural tradition.” The women’s faces, at first uplifted in wonder, now fell back into expressions of despair. But then another man stood up, and, clearly motivated, he said, “OK, we’ll do it.” That man, it turned out, was Zerihun Neguse, the Village Chairman. Thirty minutes later, Neguse had gathered 200 men in a field near the center of the village, telling them that the new gender-sharing water carrying program would begin the following day! Would this really happen? Fortunately there were project staff posted in the area, and they went back regularly to the village. Sure enough, the men were carrying water. It was time to get the word around, so I sent the story to the New York Times, the BBC and lots of others. The group that picked it up was none other than the Stockholm Water Institute, the organization which presents the equivalent of the Nobel Prize for water-related accomplishments – a prize presented by the King of Sweden. A group from the Stockholm Water Institute proceeded to Dembeli Keta, watched the men carrying water, interviewed the Chairman, wrote up the story in an issue of their publication dedicated to particularly noteworthy accomplishments, and, in turn, placed the Chairman in nomination for the following year’s prize. Hunger Notes: That’s amazing! Did they end up winning the prize? Jim: Sadly the prize was given to someone else, but Neguse has become a legend in Ethiopia, and visitors continue to stream to his village, hoping to catch sight of the men actually carrying water. Hunger Notes: Did you ever go back? Hunger Notes: Any parting thoughts for our readers? Third, after some years of international work, some of us get the feeling of being “burned out.” I’ve seen it lots of times. When this happens, I urge my colleagues to give in to it, go back home and do something different for a few years, something that grabs your fancy. After a few years, when we return to international development work, our perspective might be quite different – often equally engaged in the work, but perhaps a notch more detached about the immediate results. Hunger Notes: Well thank you for answering our questions and for sharing a story from your new book with our readers! We look forward to reading it. 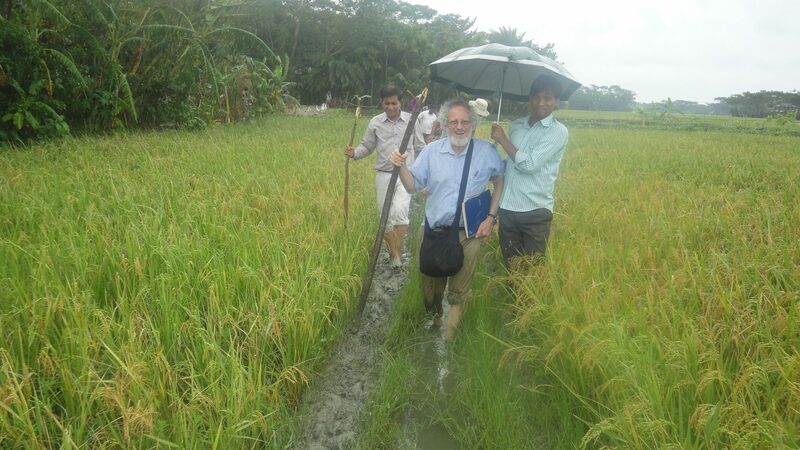 Jim’s book, Tales from the Field: 50 Years of Work in International Nutrition, is available here.